The pirate theme running through Fortnite continues with a new set of Fortnite Buccaneer's Bounty Challenges, available for a limited time only. Although there is also a Buccaneer's Bounty Event running at the same time, these challenges aren't exclusive to the fresh LTMs released every day for that event, meaning you can complete them in any of the competitive game modes. 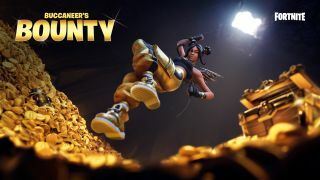 A new Fortnite Buccaneer's Bounty Challenge was unlocked every day up to Saturday April 13, and you have until Tuesday April 16 to finish them off and collect the rewards before they disappear for good. We've got details here of all the rewards you can unlock, and what you need to do to beat all of the challenges. There are a number of rewards to be unlocked by completing the Fortnite Buccaneer's Bounty Challenges, which naturally follow the pirate theme for this season. The rewards for the four challenges, in order, are an uncommon Plunder glider, an uncommon Pirate Parrot spray, an uncommon banner, and 1,000 XP. Complete all four challenges and you'll earn the epic Boobytrapped emote, where your character unlocks a treasure chest but then gets slapped about by tentacles emerging from within. You'll probably have spotted Fortnite Pirate Camps around the island by now, as they are fairly distinctive patchwork buildings decked out with cannons and flying a black kraken flag up top. There are seven different camps in total, which we've marked on the map below, and you'll need to visit one of them in 10 different matches to tick this challenge off. If you want to dig up Fortnite buried treasure, you'll first need to find a map. Unfortunately, there's no guaranteed locations to get these, as they're found as random loot or in chests, so you'll just need to keep looking around and hope for the best. Once you find a buried treasure map, which takes up one of your inventory slots, select and activate it to display a dotted line leading to where to treasure lies. Follow this to where X marks the spot, then use your pickaxe to dig up the buried treasure chest and search it to complete this challenge. The Fortnite cannons can be a handy way of blowing up obstacles ahead of you, or launching yourself over great distances, and it's the latter property that's required for this challenge. Get to a cannon, which can be found at Pirate Camps and other locations marked on the map below, then shoot yourself out of it in five different matches to complete your goal. The Fortnite Buccaneer's Bounty Challenges are now over, so instead why not check out where the Fortnite Ballers can be found and go exploring in a giant hamster ball.